Shades the Order Pane blue or red and increases the size of the Buy or Sell button when you are about to submit a trade. When hitting the bid, the cursor moves to the Sell button; when lifting the offer, the cursor moves to the Buy button. Keeps the account number you type in the Order Entry pane until you submit an order. Clears the Quantity field after you submit an order. This setting is enabled by default. Lets you seed the market quantity in the Order Pane by clicking a quantity cell in the Market Grid, Spread Matrix, and Quote Board. If Join on Left Click is enabled on the Trading tab, a right-click on the quantity cell performs this function. When disabled, clicking a quantity cell seeds the order entry window with zero or a default quantity if defined in an Order template. Seed zero if market qty exceeds max qty: Seeds a 0 in the quantity field if an aggressive action is taken to invoke the Order Bar and the market quantity is greater than the maximum quantity defined in Customer Defaults. Order Pane: The Order Entry pane on the Market window. MD Trader: An MD Trader with a yellow border. Order Bar: A thin red or blue interface, which can be used in conjunction with hotkeys. Note: A Market Grid with two tabs launches the same floating order entry window. Refer to Using Multiple Floating Order Entry Windows. Join on Left Click: Joins the bid or ask when you left-click a quantity field. When enabled, a right-click will initiate an aggressive action (hit the bid / lift the offer). Note: If you disable this property, the left and right-click actions are reversed. Reset customer: Displays a <Default> customer in all floating order entry windows when the window is relaunched. When disabled, the last selected customer appears after the window is closed and relaunched. Sets the number in which the quantity field will increment when you use the mouse buttons to change the field or click the up and down arrows. Example: A setting of 5 will advance the quantity field from 10 to 15 if you click the up arrow. Replace quantity on button click Replaces the quantity to be traded with the number on the quantity button. If unchecked, the number on the quantity button is added to the number in the quantity field.This property lets traders who always trade certain sizes to set up their buttons with those sizes and then seed those quantities with a single click from the Order Pane and MD Trader.Note: When enabled, only a left mouse click on an MD Trader quantity button will replace the quantity by the amount of the button value. Increases the speed at which you can submit orders by moving the mouse to the Buy or Sell button when you click the bid (sell) or ask (buy) side of a contract. Works for the Order Entry pane and Order Bar. Rejects placement of Stops, If Touched, and Trailing orders if they will be immediately triggered as soon as you submit the order. Resets the trade quantity back to zero, if the inside market backs away from the trigger price. Note: This property is for trigger orders waiting for a specific quantity to trade at a specific price level. If the product trades beyond the trigger price, the order is triggered regardless of the quantity traded. Enables the Market Order Limit. Number of ticks: Sets a limited number of ticks you are willing to pay to fill a Market order. Sets Passive orders to automatically hit the bid or take the offer of a competing Passive order and prevent the market from locking up. 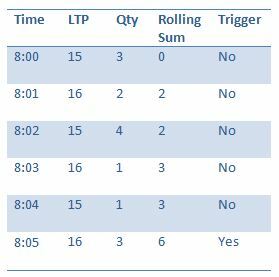 Lets you trade outside the market with a specified party using the Cross tab on the Order Entry pane. Indicates the default volume for the RFQ option on the Market Grid context menu. Timer (sec): Enables and defines how many seconds the RFQ button displays that an RFQ has been submitted. Allows a user to select a customer and account for routing the order per market instead of per instrument.